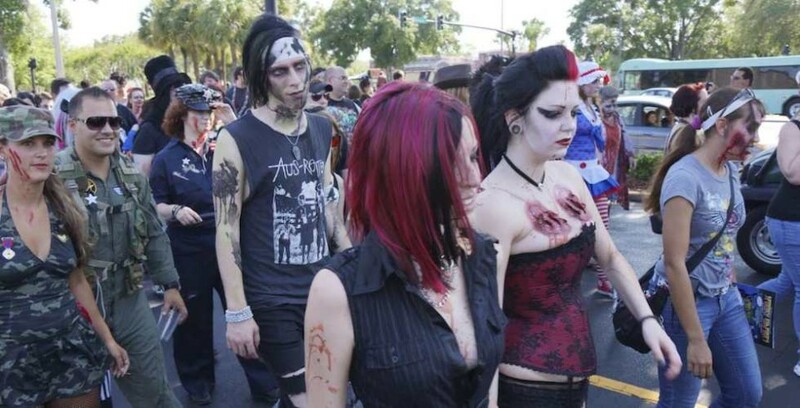 Spooky Empire kicks off on October 7 with its annual I-Drive Zombie Walk. Spooky Empire kicks off its fall thriller conventions at the Orange County Convention Center on International Drive with a Big Fat Greek Zombie Walk, hosted by Otis and the Rejects. Spooky Empire’s Big Fat Greek Zombie Walk (or crawl) will take place at Taverna Opa (Pointe Orlando, 9101 International Dr #2240, Orlando, FL 32819), where Spooky Empire will host their first ever Zombie Wedding. From noon to 4 p.m., there will be live music, special guests, vendors, food and drink specials, and zombie belly dancers. The Zombie Walk will then start at 4 p.m. and creep along until 5 p.m. Participating in the Zombie Walk is free but a ticket is required to enter the convention. For a fee of $15, participants can get transformed by professional make-up artists, Post Mortem FX and AEO Studios. All advance tickets to the convention, now on sale, are discounted. Prices increase at the door. In advance, three day passes are $65, one day passes on Friday and Sunday are $35, and one day passes on Saturday are $40. VIP Packages are $199 and include early entry to all three days, raffles, T-shirts, autograph line fast-pass, exclusive VIP party access on Saturday night with guest celebrities in attendance and a special cake designed by Eric and Patty Woller, two-time champions of Food Network Cake Wars. Tickets for children under eleven years old are free.